The Sound of Sky Larks + Being Hunted By Lions! 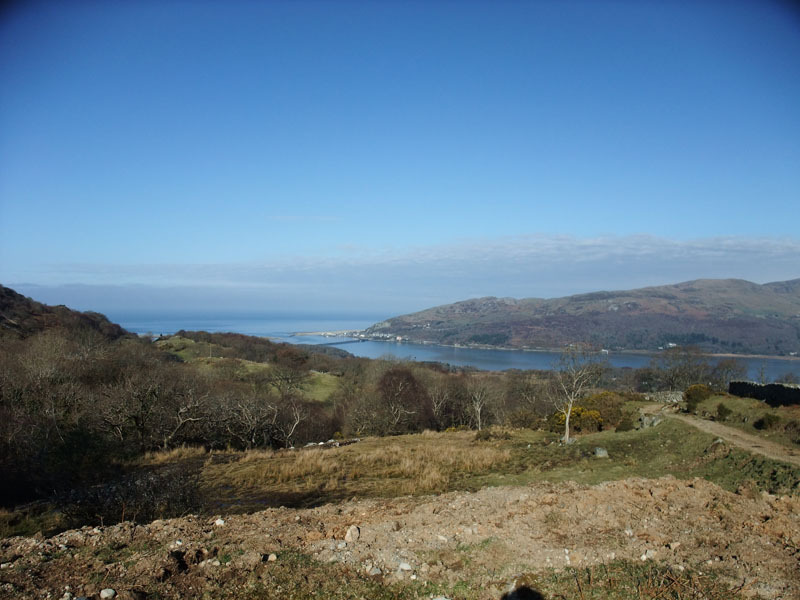 This week’s walk started from Morfa Mawddach station and headed up over the hills before finally finishing off (well finishing me off) in Llwyngwril. 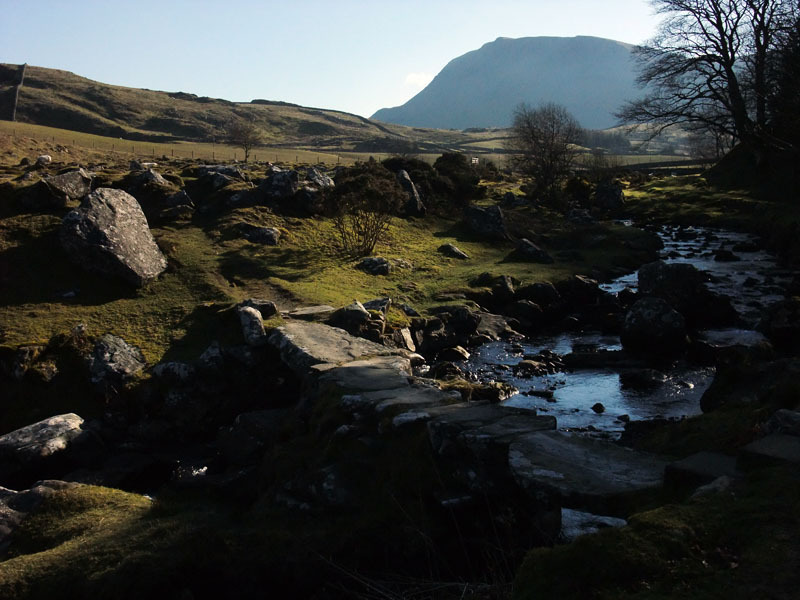 As with many things in Southern Snowdonia, Arthog Falls are hidden away. In this case through an unmarked gateway – no sign, no obvious path but they are there. I’ve driven the road from Dolgellau to Friog (and beyond) many times but had never noticed the stone steps leading up from the road before. Once off the road the path heads steeply up the side of the falls, a little more steeply than my body was ready for at 8am on a Saturday morning. But the effort was well worth it (I can say in hindsight!). The river drops in a series of waterfalls and the dappled sun on the sparkling water made up for the effort of the climb. I’d love to show an image of the waterfall but my camera decided to play up so I have none. I think it was just cold as it was OK by the time we reached the top of the falls. This is the bridge at the top of the falls. The view opens out and you can finally see the magnificent scenery that surrounds you. Walking further on and higher up we had our first view of the Mawddach Estuary below us, Barmouth, Cardigan Bay and beyond. For most of the day we could see as far as Bardsay Island but unfortunately you can’t see that far on this photo. From this photo you can get an impression of how high we had climbed very quickly… we’d started at sea level. As we continued to walk all that we could hear were sky larks and the occasional sheep. There wasn’t even the sound of the wind. It was quite warm in the sun and it could easily have been the middle of summer… we’ve certainly walked on worse days in summer. We talked about how the sound of sky larks brought back memories of beaches and relaxing in the sun. It’s amazing how a sound can do that for you. We were still climbing but at a gentler pace now. 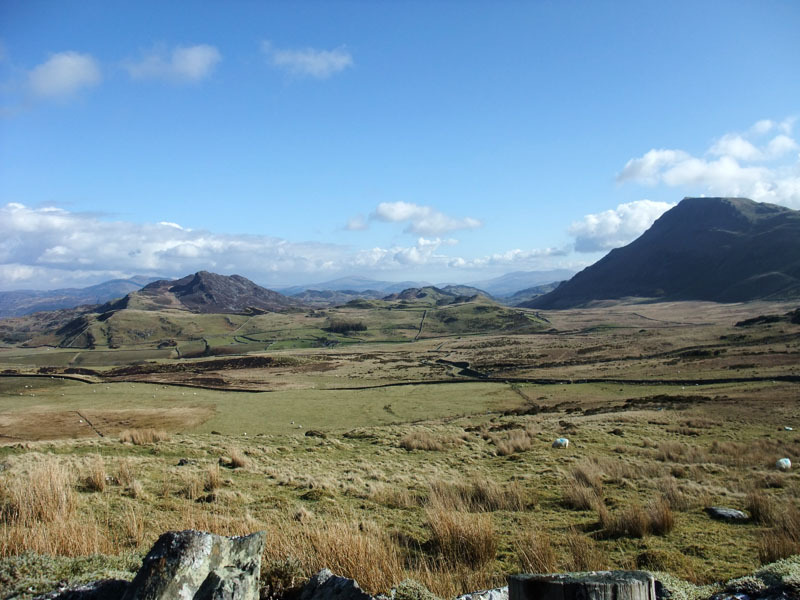 These are a couple of photos looking back across towards Diffwys where we walked last week (in not such nice weather) and one towards Dolgellau and the Arans. By the time these photos were taken we’d been walking almost 2 hours (10am) but due to the loop we’d taken to get us up the hill we were still further inland than when we’d started. I’m sure that this is where talk of being hunted by lions began. Nick told a story of a pre-dawn walk were he could hear the sound of an animal but couldn’t work out what it was. The only sound that he could liken it to was a lion hunting (obviously been watching too many nature documentaries!). Of course it wasn’t a lion and there was a rational explanation but if you see a tabloid story about lions loose on Moel Famau… you heard it hear first. Still climbing we finally came to a point above were the cars were parked… and we could see them – well I could see the sun shining on them. 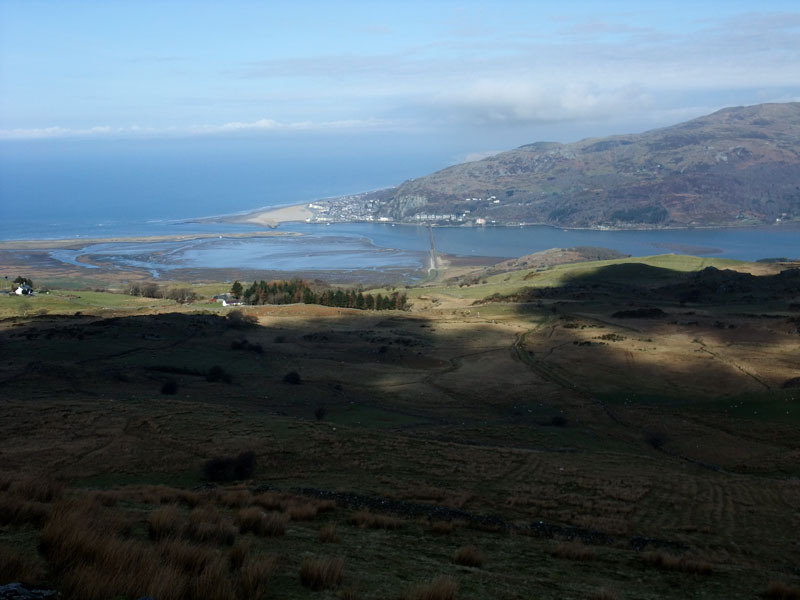 This is the view from above Morfa Mawddach. You can see by this photo that we had climbed a fair old way. This view-point is slightly off the main path. We did a slight detour to see a memorial plaque that is at this point. The memorial is to 20 US airmen who were killed when their B17G Flying Fortress crashed into the mountain in June 1945. This is just one of many World War II aircraft crash sites in Snowdonia. Soon after this point we lost sight of the coast and passed what I always refer to as “the spooky forest” (due to all of the abandoned vehicles in the middle of it) and through Cwm Llwyd. Although not a million miles from civilisation when you are up there you are in, what appears to be, complete wilderness. Again the only thing that we could hear, apart from us squelching through the occasional wet bit, was the sky larks. Eventually after a few more gates, a couple of very high stiles and some new-born lamb spotting we arrived in Llwyngwril. We enjoyed a great walk in wonderful weather and walked the best part of 6 hours without seeing another person… not many places in Britain that you can do that. 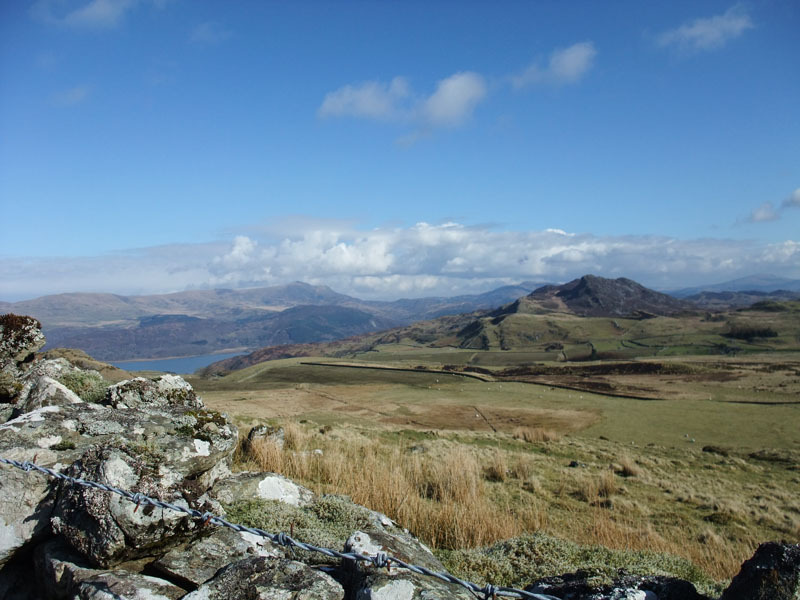 Categories: General Comment, Snowdonia, Uncategorized, Walking | Tags: short breaks, Snowdonia, Wales | Permalink. Gorgeous pictures, you were really lucky with the weather! For more photos from the same day see http://ilvenworld.blogspot.com/2011/03/sunny-day-walk-to-llwyngwril.html Nick’s also got a photo of the aircrash memorial in that blog. He also took some great photos on his walk yesterday. http://ilvenworld.blogspot.com/2011/04/walk-in-glyders.html I didn’t do that one… far too much uphill for me.